Now that the turf growing conditions have improved any problems encountered over the winter months can be fixed, to achieve the nice ‘clean’ disease free surfaces we all love. However, very soon we will be into the summer stress period – that is if we get a summer this year! Although the last two summers have been cold washouts, the long term forecast for 2009 is for a hot, dry summer (and lets face it, we must be due some nice weather). For turfgrass managers, a good summer brings ups and downs. Good weather will encourage use of the sports facility, bringing in some welcome revenue. 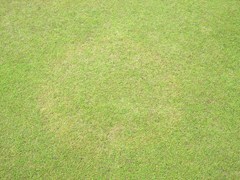 However, hot, dry weather will also cause heat and moisture stress to the grass plant. It is time to start planning for that now. April has already been a dry month and soil moisture content in sand rootzones at STRI dropped to levels where the grass plants began to show symptoms of drought stress. Basidomycete activity has already been observed on many links golf courses, even though the rootzone directly below was not showing hydrophobicity (Plate 1). It can be very difficult to rewet rootzones once they become hydrophobic and so early preventative use of a wetting agent would help to prevent dry soil conditions developing over the summer (Plate 2). Attention to fertility levels can also have an effect on drought stress. Ensuring plants have adequate potassium can help them overcome drought stress. The movement of potassium regulates stomatal opening and closing, which in turn regulates transpiration. Applications of Primo MAXX during the summer inhibit the production of gibberellic acid in the grass plant, which reduces cell elongation. Leaves are therefore smaller, with less leaf area for transpiration, making the plants more water efficient and less susceptible to drought stress. Also, when gibberellic acid levels are reduced, grass plants naturally increase their level of abscisic acid. This abscisic acid alters the osmotic potential of stomatal guard cells through the movement of potassium, causing them to close thereby reducing transpiration during drought stress. Sequential Primo MAXX applications, to keep the turf in regulation mode, have been shown to produce an increased level of cytokinin in turfgrass. 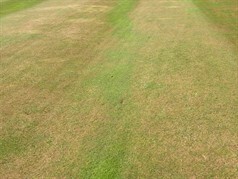 These cytokinins improve the plant's drought tolerance, helping to produce better quality of turf during summer months. Suppressing vertical leaf growth also encourages plants to increase root growth, making them better able to seek out any available moisture. Bringing together the effects of wetting agent application to prevent hydrophobic soils, good potassium nutrition and sequential application of Primo MAXX could, therefore, have a major effect on the drought tolerance of the grass plant. To have the grass plants in a position to be able to best withstand summer drought stress periods, however, a programme needs to be put in place to ensure the plants are protected before the stress period begins. Primo MAXX should be applied during the current period of good growing conditions to start increasing root growth and reduce vertical growth. It is advisable to make initial applications at half dose rate, especially where annual meadow-grass forms a percentage of the grass sward. Tank mixing with a nitrogenous liquid fertiliser, such as Greenmaster 25.0.0, also benefits the grass plant.